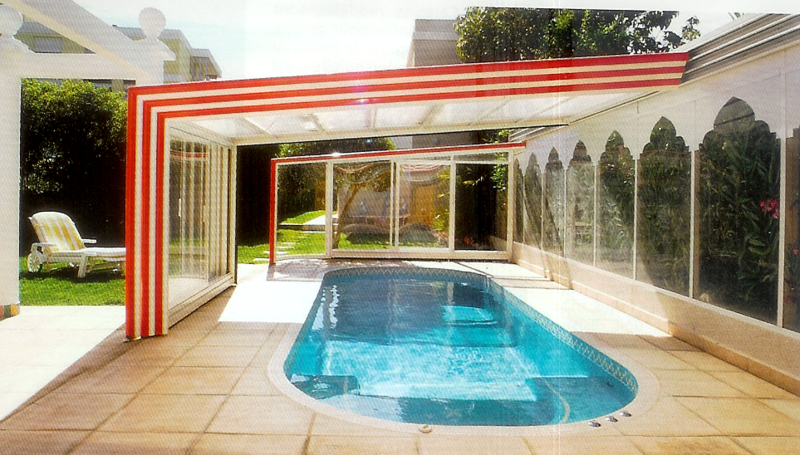 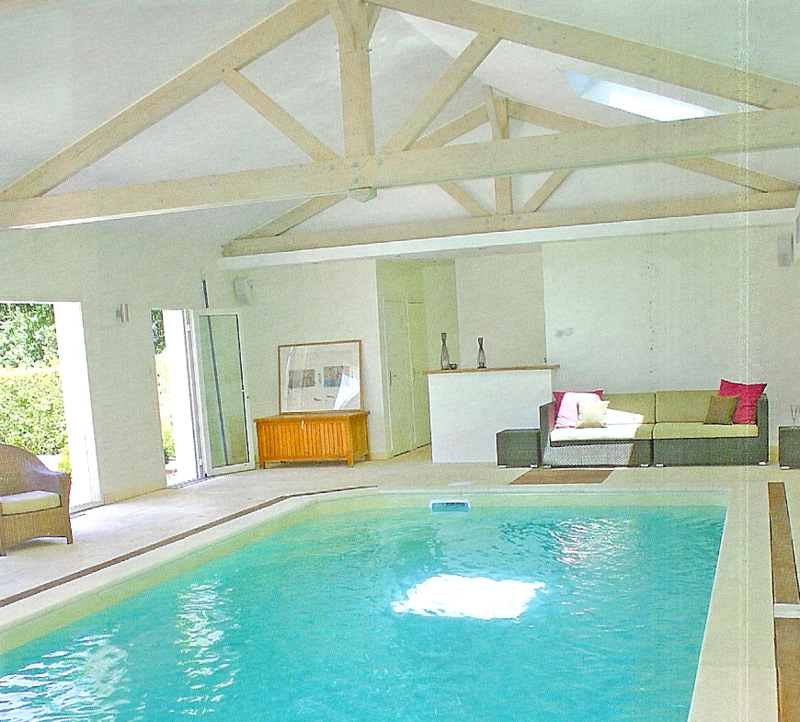 Do not rely on Your Architect to Design a Pool House - He/She needs Help! 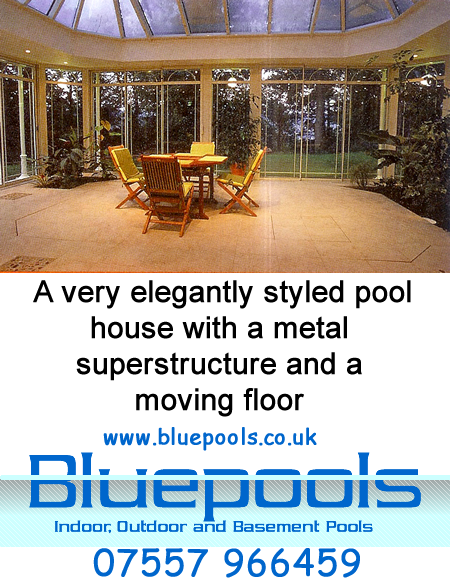 Bluepools prefers to work with the Clients existing Architect on the Design of the Swimming Pool and Pool Hall or House. 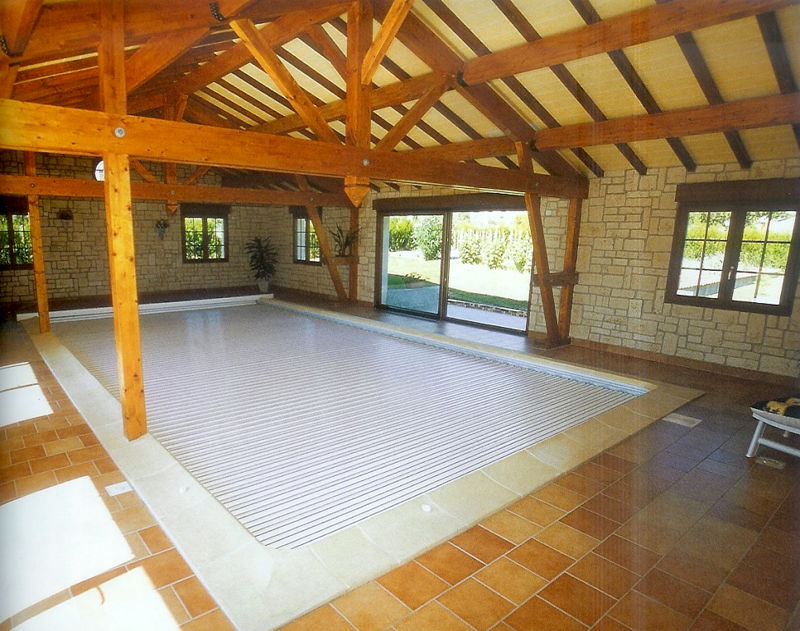 We help them to develop the Concept and then provide all the Design Details of the Pool and Pool House Foundations up to the damp proof course level make sure that the Capital and Maintenance cost of the Pool House are the most Economic possible. See the Notes below the following table below for "How to calculate the cost of an Indoor Pool and Pool House"
Conservatory style pool houses are very popular because they are the cheapest type to install. 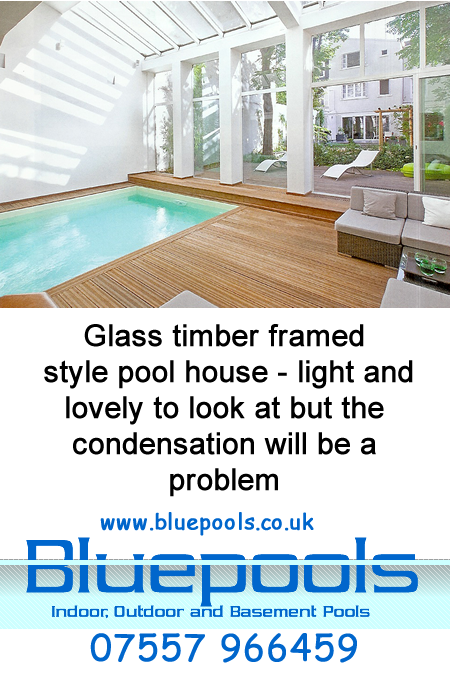 They can be made to look very attractive when new but if the pool is used frequently it is impossible to control the condensation because there is no vapour barrier in the roof. 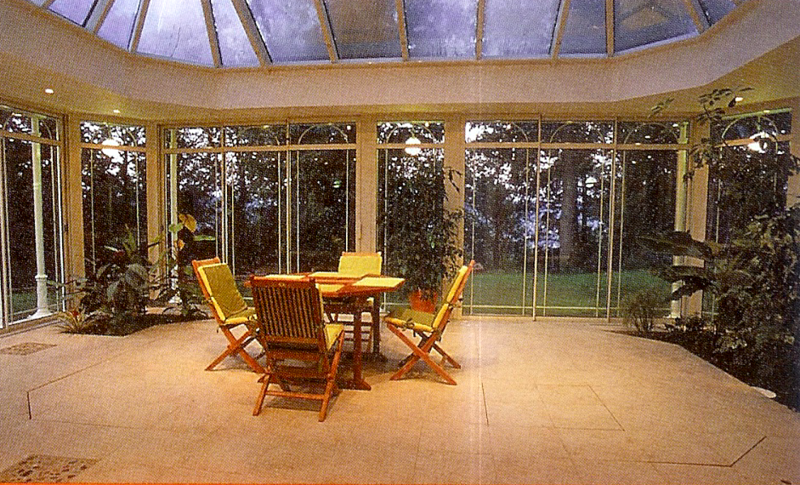 Even triple glazing will still provide a steep thermal gradient between cold air outside and the warm moist air inside that will induce condensation throughout most of the winter. 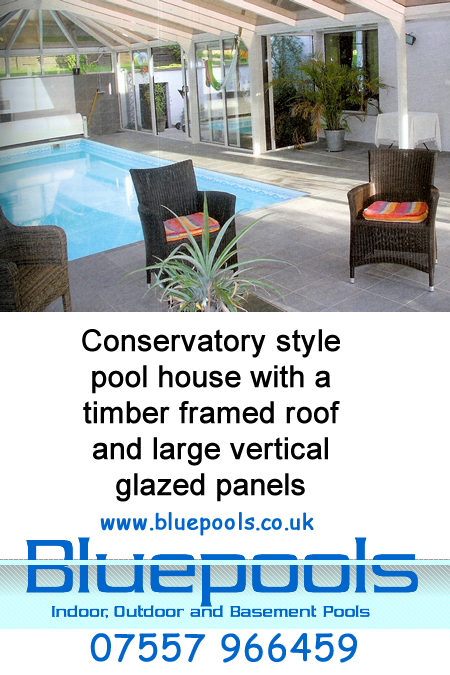 The very high windows give lots of light and life to the indoor pool and will always be particularly suitable where the pool looks out over the sea or some other panoramic view. 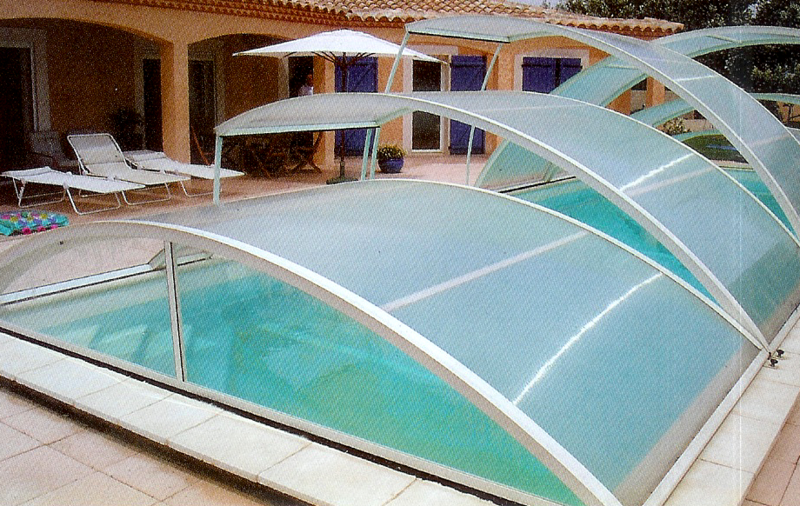 The above ground floating pool cover winder is cleverly hidden in a housing that matches the poolhouse lining. 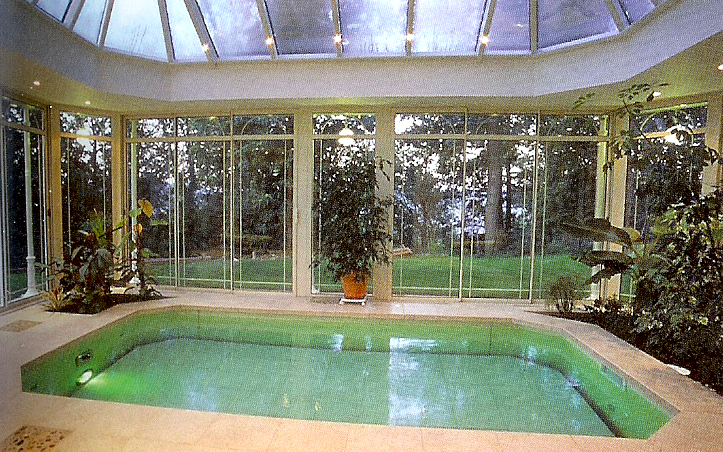 This elegant design features a moveable swimming pool floor so that the poolhouse can be also used as a conventional conservatory. 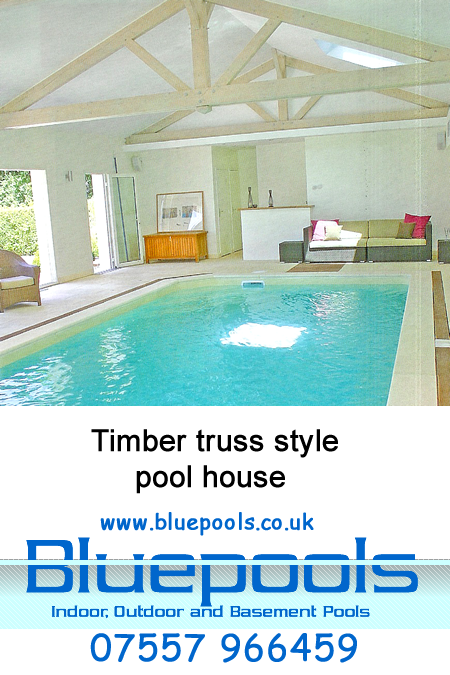 If you have a derelict outhouse or barn this could be the way to go as this very striking conversion shows. 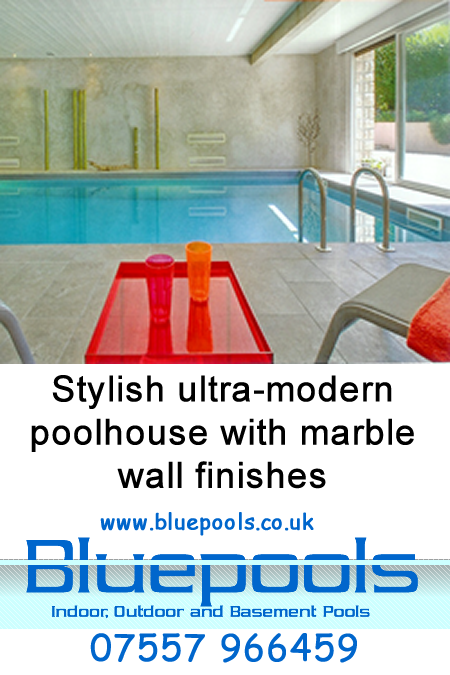 Futuristic and very stylish - but this approach only really works with luxury tiles and other up market finishes. 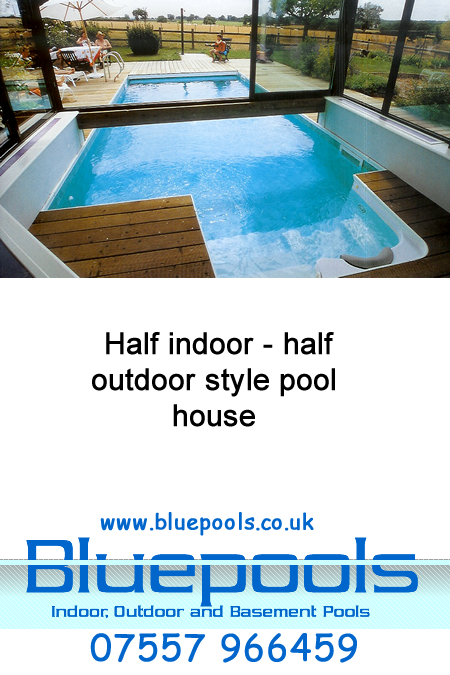 We offer you the half and half solution !! 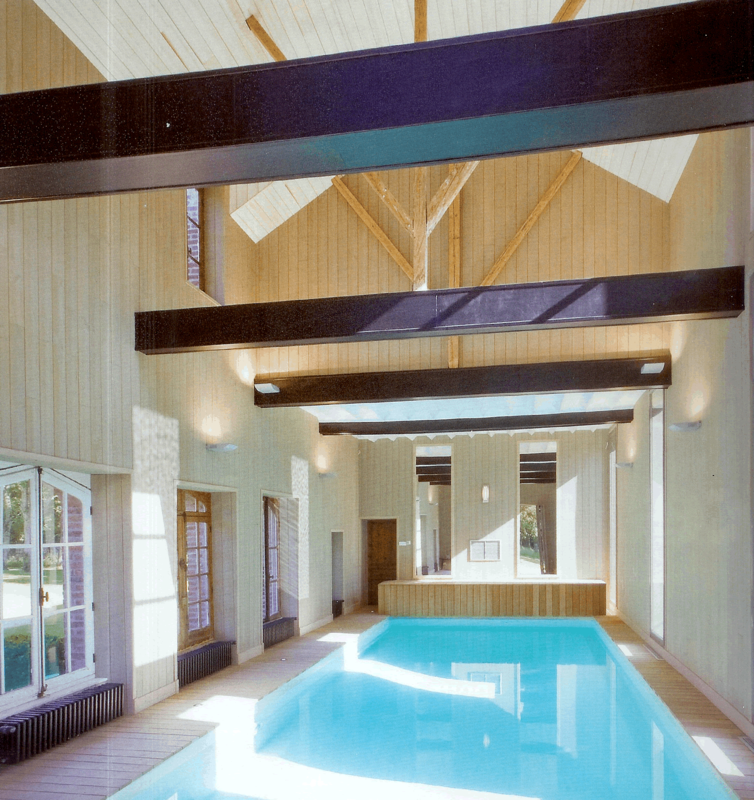 The very high bay windows and strikingly black cross beams turn this poolhouse into a very elegant and stylish structure that connects seamlessly to the garden. 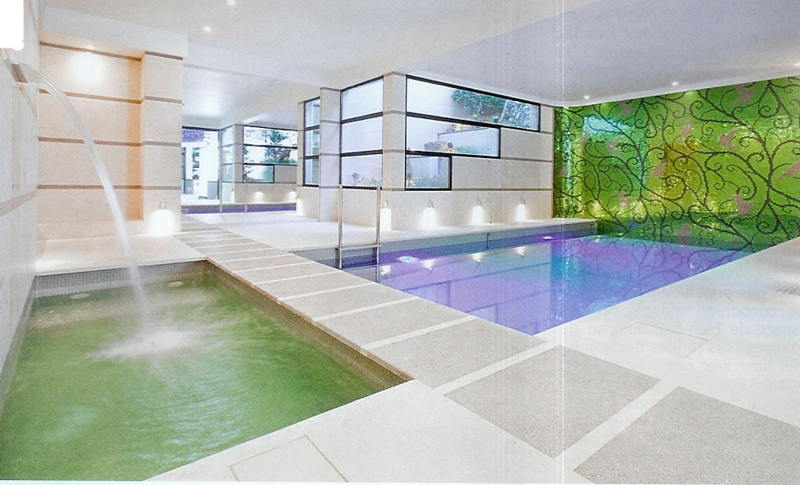 The stunning depth of the Pool Hall is an illusion created by two mirrors that double the number of visual beams. 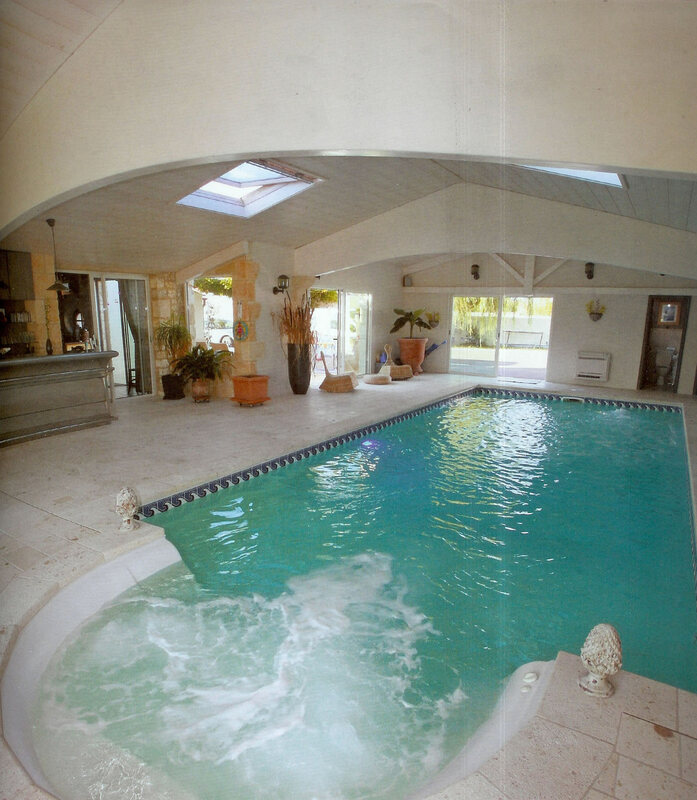 This pool might look attractive - but I included it because it is a classic example of HOW NOT TO DO IT!! 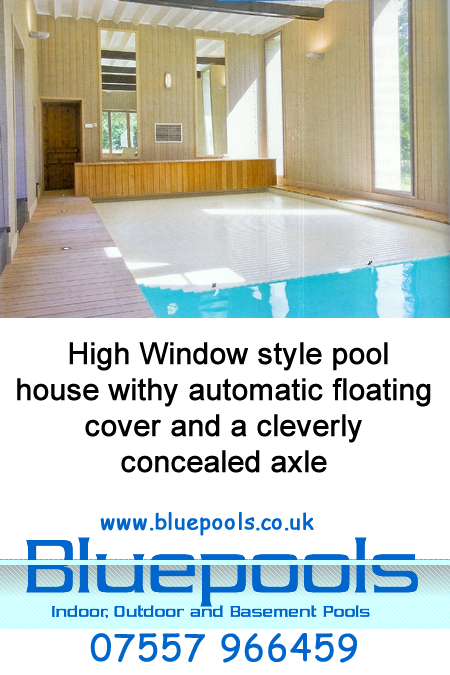 The pool is equipped with a hydraulic cover that runs in tracks along the pool coping and is very smooth and fast to operate. 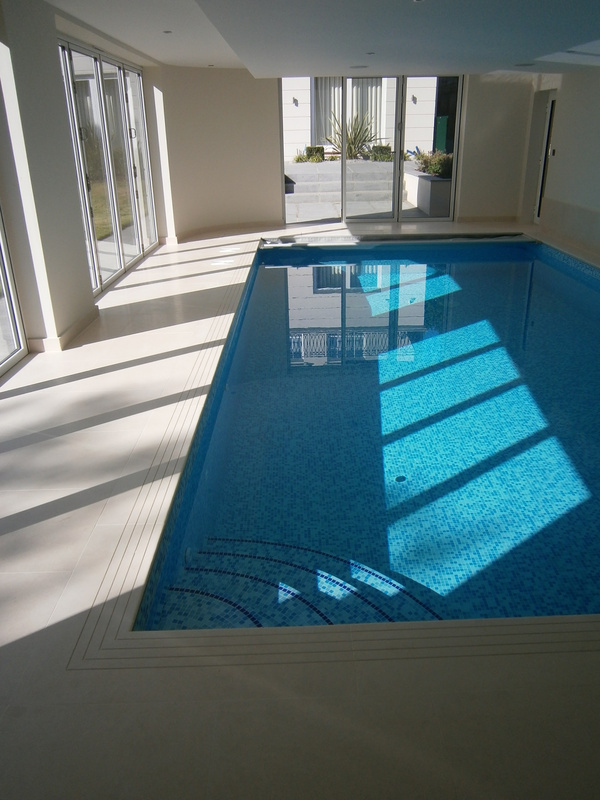 This pool was procured by a property developer - it looks magnificent but the filtration system is so undersized that it would be dangerous for 10 children to swim in that pool at once. 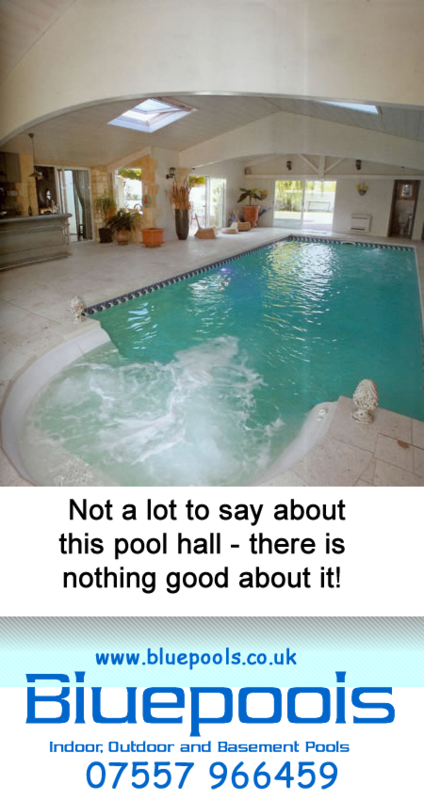 And a fortune has been spent on the finishes but there is no automatic chlorination system. 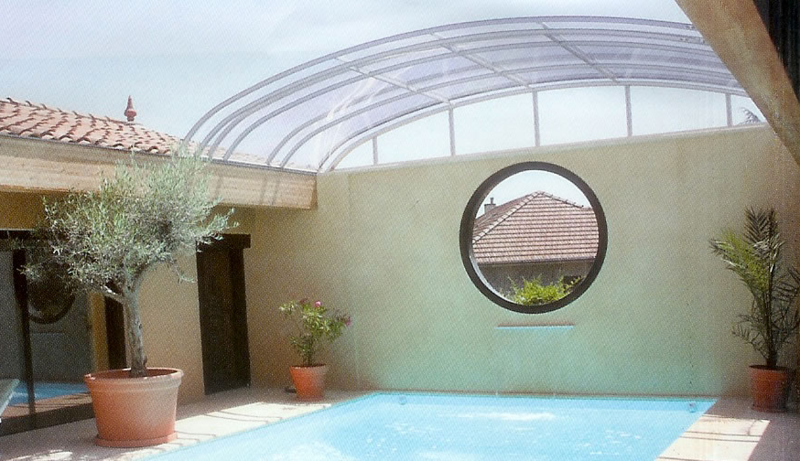 in France, many people install lightweight glazed structures that they call abris. 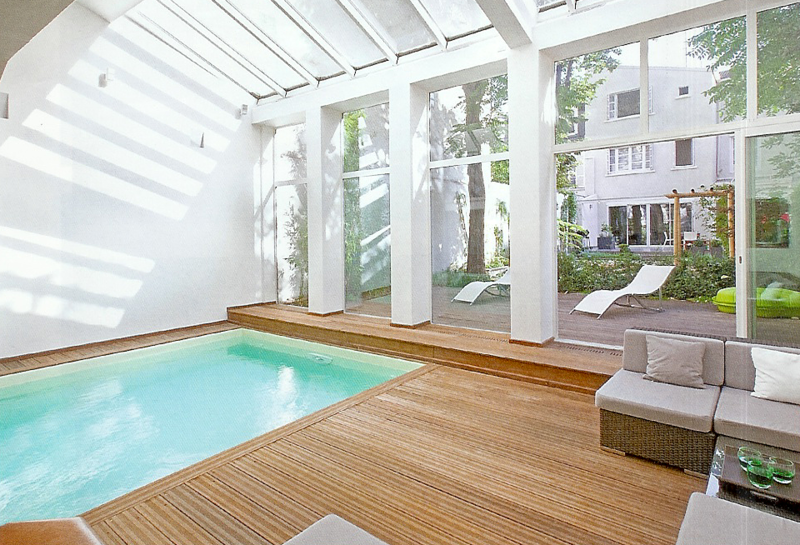 There are some drawbacks to this type of pool house but they do offer an economical way of owning an indoor swimming pool. 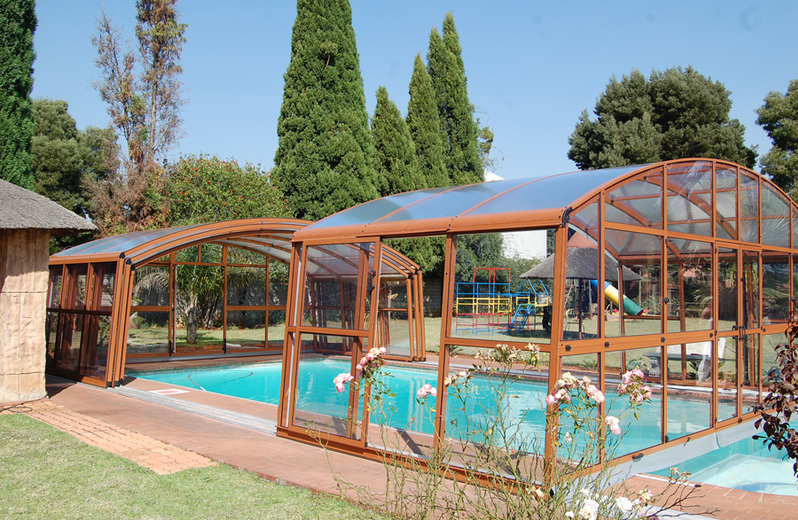 From April to September this type of cover will increase the air temperature over the pool by at least 6 degrees C.
The low level abri type covers do provide a useful safety device and probably do extend the swimming season for several months. 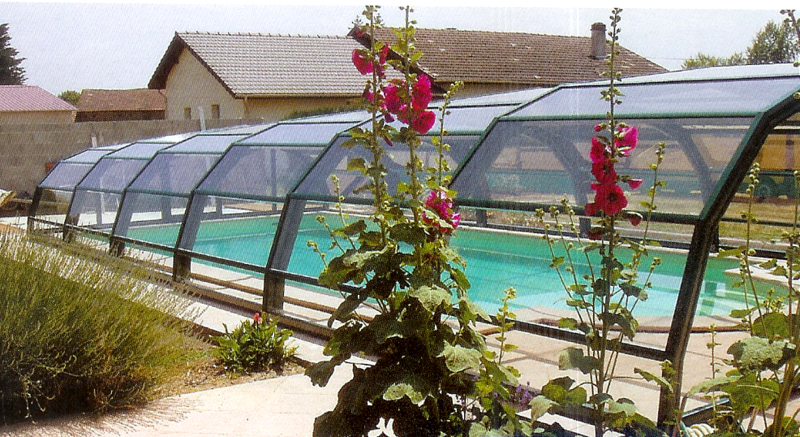 The higher these structures are - the more prone they are to being damaged by winter winds. 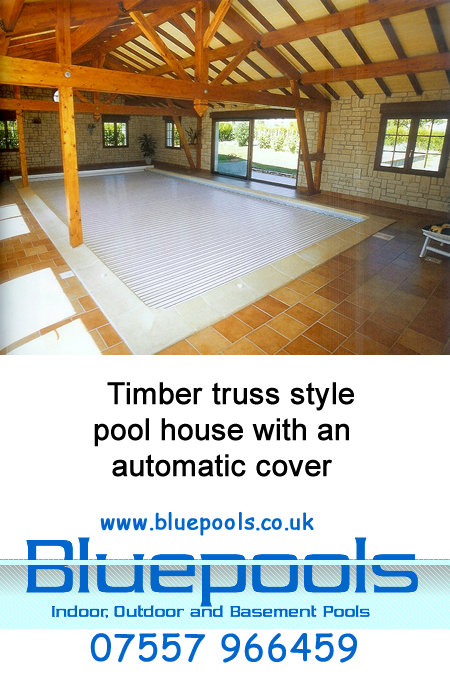 The name says it all - these are clumsy looking yet effective structures that give some of the advantages of both indoor and outdoor swimming pools -,im not sure about the red bits though? 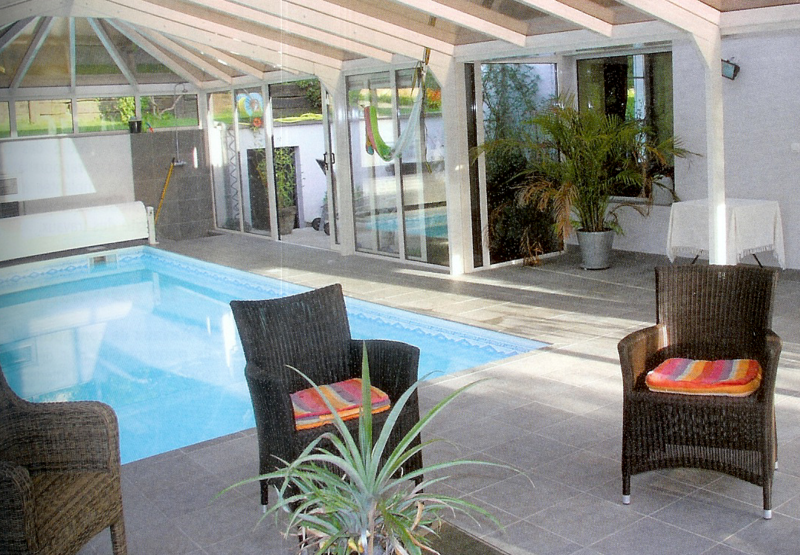 There is not a lot that can be said about this apart from "If you want one of them in your garden you are a better man than I am Gunga Din"
This looks a bit more like it huh? 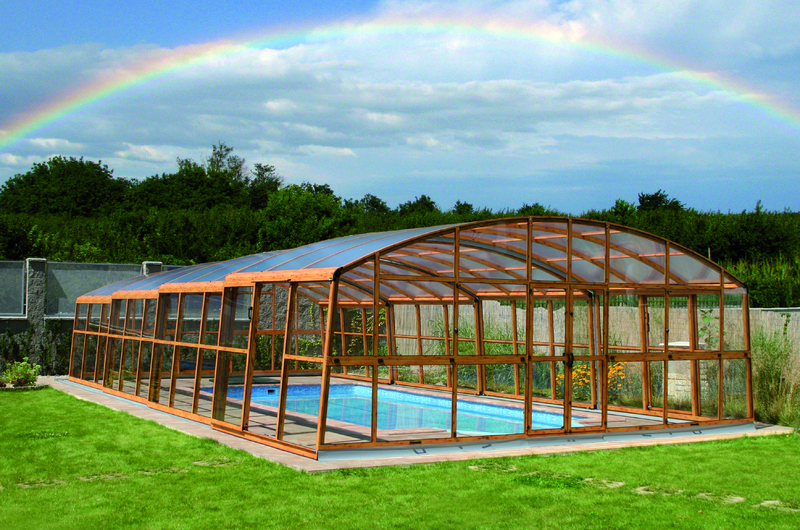 These up market abris can be supplied in timber or aluminium frames with a surprisingly good paint finish - but be warned - they are not cheap! 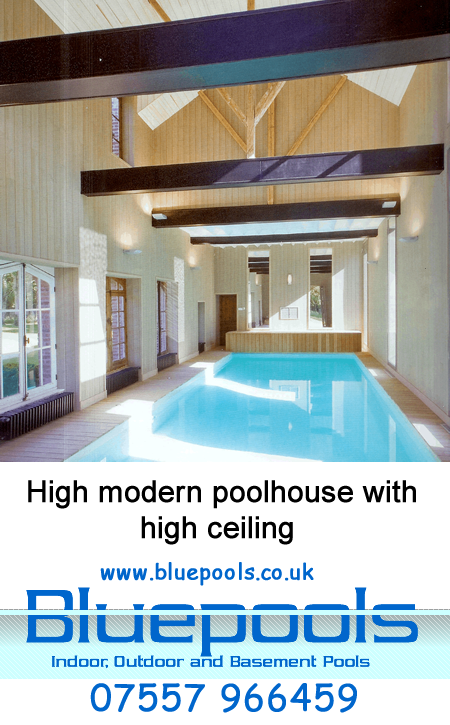 First of all decide How big your indoor pool is going to be - they can be anything from a spa sized 4 x 2 metres up to a 25 x 4 lap pool. 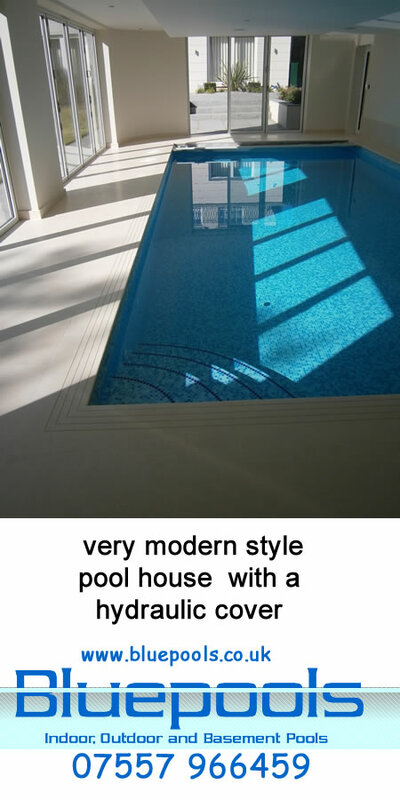 When you have calculated the pool area multiply this by the Size Factor from the graph above. 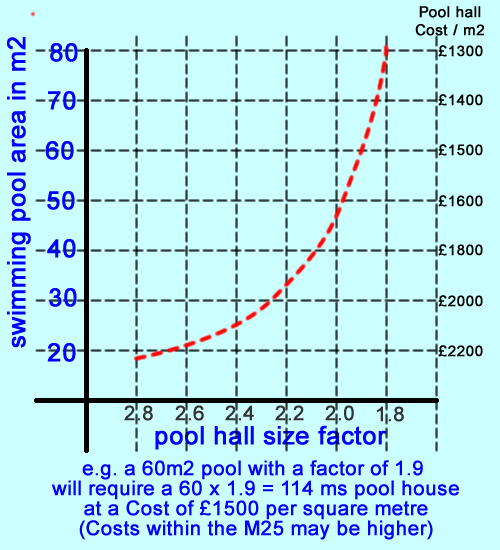 The Costs per square metre in the table below are the total cost of the pool and pool house based on the pool house size. 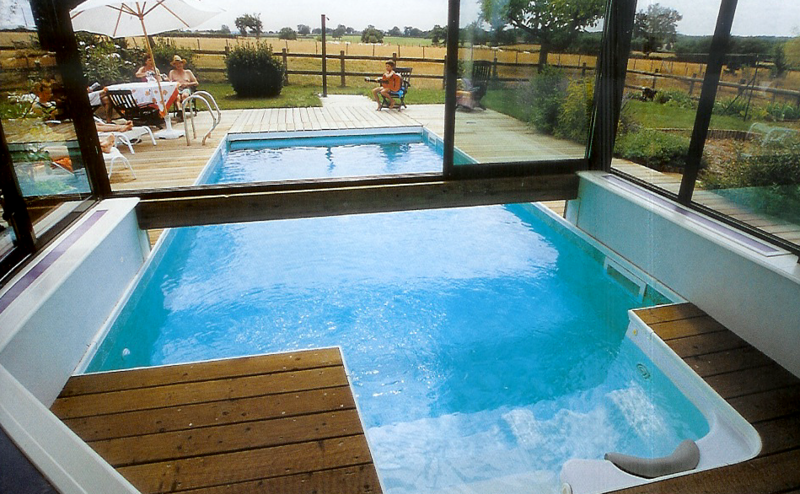 The size factor assumes that the pool has a 1m space around it on 2 x long sides and 1 x short side and 3 metres on the other short side. 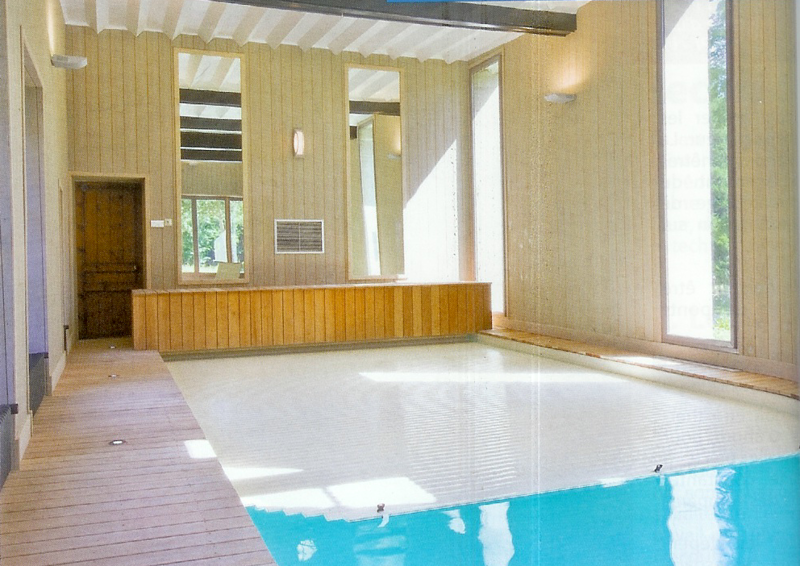 The pool plant is housed under the concrete pool deck that surrounds the pool within the pool house. 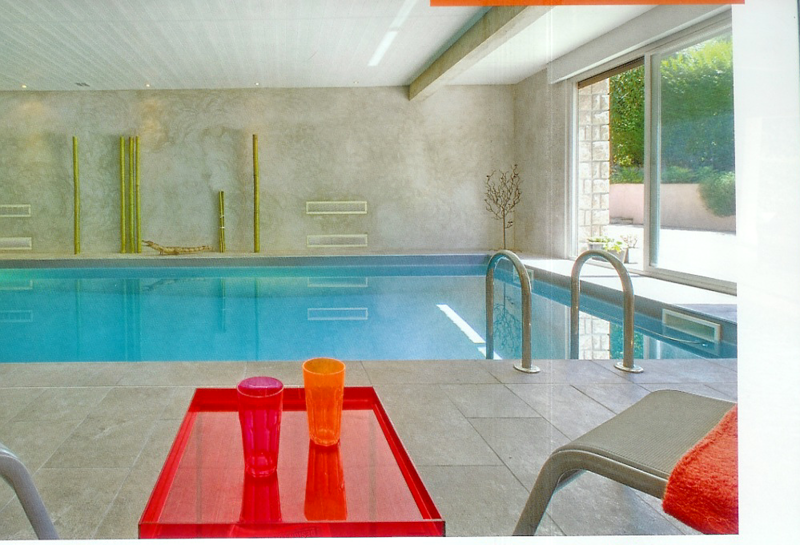 More Examples are shown in the table below. 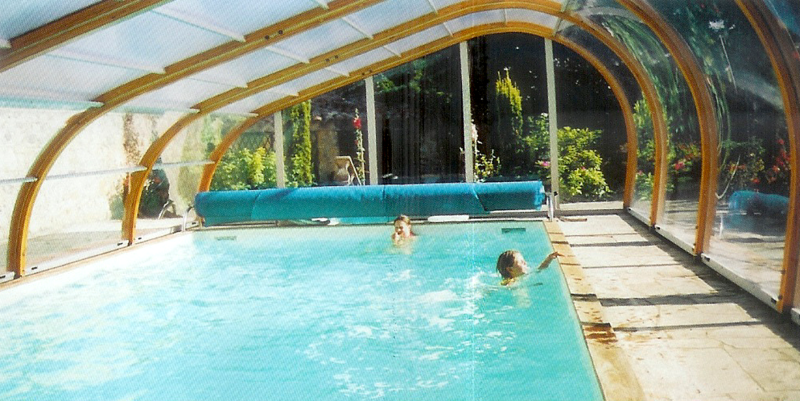 The cost of carting excavation arisings off site to a tip can be very high and if the pool is to be tiled the cost will also increase substantially. 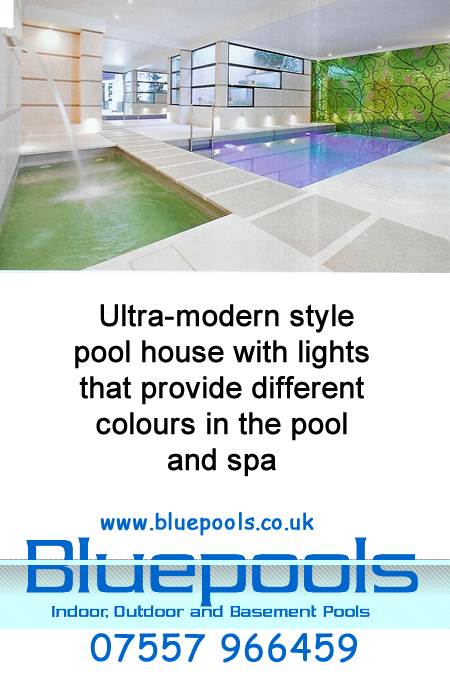 The costs will also depend on the qual;ity of the floor, ceiling and wall finishes as well as pool equipment such as automatic covers etc.